Yesterday's attack in Kabul, killing many Americans and one Canadian, has re-raised a bunch of questions about the politics of the Afghanistan mission in Canada, along with a blog that blames the CBC for killing the mission, a CBC story that promotes the Granatstein and Bercuson piece that I already discussed. The basic question for the moment (on twitter anyway) is who is to blame for the ending of the Canadian mission? Let me run through the candidates before I address the dubious nature of the question itself. The aforementioned post by Unambiguously Ambidextrous [U.A. ]argues that CBC's focus on the detainee issue undermined Canadian morale, ultimately leading to the collapse of the mission. I would agree that the media focused largely on the wrong issues most of the time, as the detainee mess might have been the closest thing to the Somalia disaster but was still far from it. The Canadians actually did a fair amount of due diligence--never accused of beating detainees (although there was one officer who was prosecuted for killing a wounded Taliban), stopping the turning over of detainees to the Afghans when there were reports of abuse and so on. What the Canadian media never conveyed well was that Afghanistan was not Bosnia nor Kosovo--that NATO and everyone else treated Afghanistan as if it had a government with all the sovereignty stuff that entails. Which meant that Canada faced difficult choices, just as every other country operating in the country. The initial detainee agreement might have been insufficient, and, yes, some detainees got beat afterward the Canadians handed them over. BUT this was not American-style rendition where one deliberately turns folks over to be tortured. The problem with U.A. 's assertion about detainee news and public opinion is that public opinion turned south long before the media focused on detainees. Nope, the public starting opposing the war in the fall of 2006--when Canadian Forces did two unexpected things in fairly significant numbers--get killed and do some killing. I am still unsure how much of the opposition was about aversion to Canadian casualties versus the identity crisis created by Canadians doing more than peacekeeping--killing folks. Given my announcement last night that I am essentially a lame duck, awaiting the transition to Carleton and Ottawa next July, you might think I would stop complaining or blogging about McGill and Quebec. Well, then you do not know me. So, while we have a strike of staffers, the Teaching Assistant union (yes, they are unionized) is starting to make noises about labor actions. They struck a few years ago during finals--thankfully when I was only teaching an 80 student class. I am now teaching 600 students in one class and 80 in another. But I am prepared. Due to the flu a year or two ago, I now have standard language in my syllabi about reserving the right to change the grading/exams in case of an emergency. Written for flu, may come into play for a strike. Yep, I would replace essay finals with multiple choice. Because with 600 students, I would not have a choice. I would have time to react as my final is on the second to last day so any strike would be announced before then. So, there is a bright side to such a late final date. And, TA strikes will be irrelevant in my new position as I will be teaching only graduate classes (at least almost always). I was reading a piece yesterday where Qatar was basically given credit for "punching above its weight" and all I could think was: drink! Yep, it is time for some help in developing the rules for the international intervention drinking game (with much of the inspiration inspired by NATO." Metrics--as in: we need metrics for success. Two-tier NATO. As in countries that do more and others that do less. Burden-sharing. Oh my, we will get drunk quickly. Anytime there is an acronym that takes more than five seconds to figure out. Drink twice if the same acronym refers to two or more NATO concepts (SMR= senior military representative and six month review). Anytime there is an acronym that takes more than five seconds to figure out how to say aloud, as in PIFWC. The aforementioned "punch above its weight." When anybody expresses shock that countries and organizations might discriminate and be selective about where they intervene. Benchmark or Milestone (and only drunk people can really articulate the difference between the two). Russia/China condemning external interference in the domestic affairs of countries (only small sips as this will happen often). What am I forgetting? Anything my readers might suggest to add? Yes, I am leaving R2P out because I don't want to be responsible for anyone's alcohol poisoning. Exit strategy. This would lead to lots of controversy--the phrase would be uttered so often that any player would become catatonic, but we actually never see a real exit strategy, so one would have to chug if one of those ever came along. Boots on the ground. And drink twice if media folks start debating what counts as boots. Oil. Again, only sip unless the conflict is in some place where no one would ever expect oil (Afghanistan). Whole of Government. To which I would add: comprehensive approach, civ-mil integration. Oh, and I forgot, if someone mentions Paddy Ashdown as a solution to the problems of coordination among the panoply of international and non-govt organizations, one beer must be chugged. Spanish Defence Minister Carme Chacon on Tuesday said Spain would withdraw its troops from Libya as soon as Nato formally announced the end of its operations there. “As soon as Nato formally confirms the end of this operation, Spanish assets will be immediately pulled back to Spanish territory,” she told a press conference. “This means that all the troops that we have today in Libyan territory will be in Spain before October 31,” she added. “The efforts carried out during these seven months have borne fruit,” Chacon said. Does this mean that Spain had some SOF in Libya or that this was a mistake, as she was referring to the planes flying out of Sardinia and the troops on Sardinia supporting the sorties? We have no idea since SOF guys can be quiet and secret. I would be surprised if Spain had SOF on the ground since it never seemed to be enthusiastic about the mission--Spain did not drop bombs on Libya as far as we can tell, unlike the ambivalent Italians that started out refusing to bomb but then got more invested in the outcome, including the deployment of SOF. Still, sending SOF is somewhat less risky/less costly/more likely for a hesitant country since the secret sauce allows for deniability. The Minister for Defence said that of all the efforts undertaken by NATO on this operation, only 30% of the missions were launched to neutralise terrestrial targets. The remaining 70% of the missions were related to establishing and maintaining the no-fly zone and the naval arms and mercenaries embargo on Libya. "And the Spanish contribution to these objectives was considerable", said Carme Chacón. What is the Spanish for punching above one's weight? Insert smiley face here. So, Spain is quick to announce a withdrawal of forces that did not take part in the kinetic side of things but in a statement that emphasizes the contribution. I am back to feeling comfortable about how predictable this is playing out. 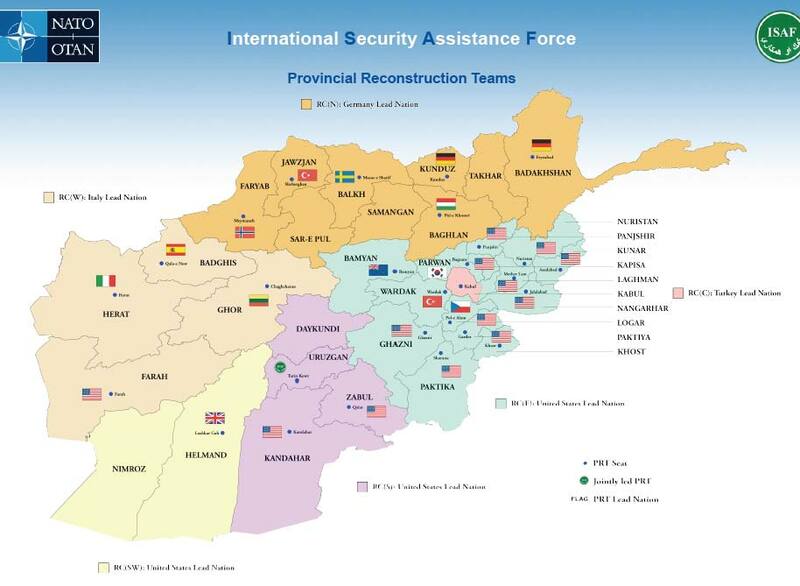 The second wave of transitions for Afghanistan have been announced. 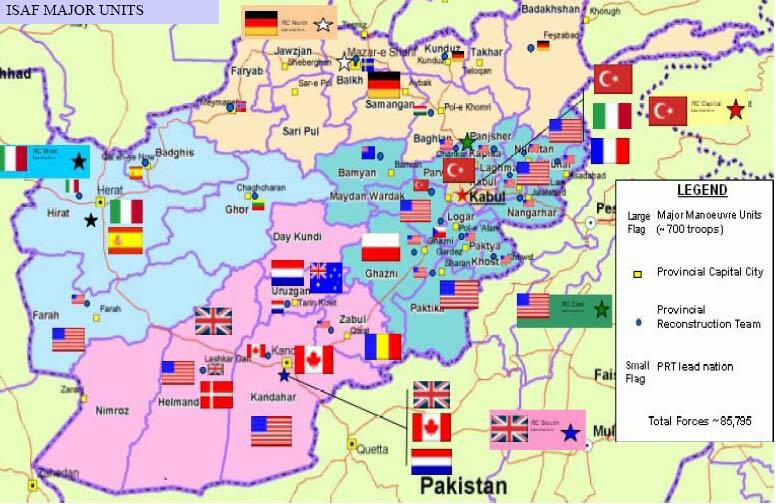 There are the areas of the country that will be turned over next to the Afghans, with NATO moving to a supporting role and then a reduced role and then exit in each of these areas. I have already discussed this process here, here, and here. Second wavers include: "Helmand in the south, Nimroz in the southwest, Ghor and Herat in the west and Day Kundi in central Afghanistan. Also on the list are Balkh, Parwan, Takhar, Badghis, Sar-e-Pul, Samangan and Badakhshan in the north; and Kabul, Ghazni, Wardak, Laghman and Nangarhar in the east." The surprises include Kabul and Herat since they were on the previous lists. Helmand would be a surprise, given that it has been the most violent province in Afghanistan for much of the conflict, except the first wave included Helmand's capital. Still pretty shaky. Nimroz? NATO never had a significant presence there because it is underpopulated, but this hunk of Afghanistan borders Iran and Pakistan, so hmmmmm. The eastern provinces are perhaps the more stable of the ones in the region, but that is like saying that Alabama (just a stylized example) is better off than Mississippi and Louisiana (please excuse me if I got the relative order wrong). The northern provinces are less surprising both because the threat is lower and because NATO has not been doing much in many of them. The Germans have a very narrow footprint in Feyzabad/Badakhshan for instance. There has never been a long-term presence by anyone in Day Kundi. So, an interesting mixture of low-hanging fruit and places where transition is incredible--as in hard to believe Afghan forces and government could do much. The theory behind transition is that NATO can eventually re-deploy the troops from the transitioned places to the ones still needed significant help--Kandahar, Zabul, much of Eastern Afghanistan. But that will not happen as the troops in the North and West will not move south--unless south means out of the country. Those caveats become relevant again. Anyhow, something to keep tracking. Perhaps I am not a Liberal in the IR scheme of things, given my skepticism about the UN, as displayed in the latest Current Intelligence column. Of course, I am still talking about conflicting interests, so I am just a pessimistic Liberal, not a Realist. Because labels are the thang, right? * I am not so sharp on US history to be sure that Cheney was the worst. But given how much power he had, he certain must be a contender. Rummy, well, we've been through that before. Of course, in that group of ideological folks who found reality to be inconvenient but not a constraint on their policies, Rice comes off as relatively sane. I do find it amusing that she has interesting standards. When discussing Qaddafi and his fixation toward her, Rice refers to a video he showed here as: "It was weird, but at least it wasn't raunchy," Rice wrote. When it came to this notoriously warring couple, Rice had an insider's view. She believed that the distrust between Bush's first-term secretary of state and his secretary of defense made the bureaucracies beneath them almost incapable of making decisions. She also saw that they had very different styles and that Powell, with his more nuanced approach, often lost out with Bush often preferring Rumsfeld's more "black-and-white view of the world," in particular in the aftermath of the 9/11 attacks. Well, where is Rice in this contest between Powell and Rumsfeld? Seems from the book blurb that she felt that Powell might have the right side. Why not, hmmm, take sides? I have not read the book and probably will not do so soon unless I end up teaching an American foreign policy class, but this quote alone indicates that Rice saw herself as just a coordinator, rather than someone who might actually shape the choices the President faced. Rice should have pushed back with the help of Powell on things that she felt were wrong. Instead, she gets to watch and note that Rummy beat Powell. You did a heck of a job, Ms. NSA. Rice saw [ then-Prime Minister Ibrahim al-Jaafari of Iraq] as one of many less-than-ideal leaders for Iraq after the U.S. invasion, deeming this one more suited to be a professor than a political leader. Project much, Condi? I don't know how Rice was as a professor at Stanford or as a provost, but surely she was better suited to that than as National Security Adviser. When Bush finally told Rice a few days before the 2006 midterm elections that he had decided to replace Rumsfeld with Bob Gates, she recalls, "I could barely contain my joy." I felt the same way when the entire Bush team (except for Gates) was leaving the White House. Rice, Cheney, Powell, Rumsfeld--what a freakin disaster. I attended a student's practice job talk that was about the campaigns for and against referenda on the European constitution and then Lisbon accords. The student mentioned that the No folks raised the spectre of a European army as part of a common European defense. I could only giggle. Then I was teaching my IR of Ethnic Conflict class when the topic moved to Yugoslavia and the "Ice Cream Men" who were the EU observers, whose presence was supposed to deter violence. Giggle 2. Time after time, the idea of Europe confronts the reality that countries conflict with each other not only of how to respond to threats but what the threats might be. Germany helped to destroy any concept of European foreign policy in late 1991 when it pushed recognition of Slovenia and Croatia even though the Badinter commission considered Slovenia and Macedonia as the viable candidates. 2003 revealed big divides between European countries (Rummy was not entirely wrong about new vs old Europe, except that UK and Spain would be, ahem, old) over how to react to the US invasion of Iraq. Afghanistan demonstrated that burden-sharing would always be a problem. Sitting out of the Libyan effort, Germany showed that it will not go along with the rest of Europe. Unless it means cutting the defense budget. Today, there are many tweets and stories about Germany gutting its military in response to the economic crisis. This coincides nicely with French, British, Dutch, and other defense cuts. So, the reality of European defense is actually not a laughing matter. Forget about European defense--they will not have the capability to do much, even collectively. While the US will be cutting as well, the disparity between what the US can bring to the battle and everyone else will remain wide and get even wider (the Brits may lack planes for their carriers, for instance). This does not mean that other Libya's cannot happen, but the day Europe acts on its own and coherently is farther and farther down the road. And fears of European militarization are quite laughable, indeed. Stephen Walt posits that Liberals are musicians and Realists are jocks in his column on China and American higher education. He argues that Liberals underestimate the competitiveness of international relations whereas realists see that providing others with any advantages can be quite detrimental. The metaphor is fun to play with, so let me continue with sports and IR. Where Walt sees sports as competitive, which means that teams do not help other teams, he ignores the big problemo for Realists: there is more than one way to compete. Let's stick with Walt's American football analogy: any Sunday, one will see different teams with different strategies playing against each other. Sure, there is lots of imitation among the innovation, but successful teams adopt new strategies depending on their own strengths and weaknesses and those of their adversary. While Walt would make much of the cheating that Bill Belichick of the New England Patriots did a few years ago, I would note something else--that Belichick is known for adapting to circumstances. A defensively minded coach is now heading a team focused on scoring much more than preventing the other team from scoring. At the same time, other teams have been successful by focusing on great defense and do-no-harm offenses. No single strategy is correct. But realists tend to believe that smart leaders can divine from the international system the single best way to compete. In the jungle, where survival of the fittest is not hampered by rules or a League commissioner, we still see a multiplicity of strategies and attributes that allow a variety of species to exist (well, until the humans destroy the forest) and thrive. The same is true in international relations--there is no single best strategy most of the time, and lots of choices have difficult tradeoffs and uncertain outcomes. Moreover, Walt gets Liberals wrong. We are not all the same. I am skeptical of international organizations (despite my recent re-kindled love for NATO). Liberals understand that the world is competitive, not because we all seek power, because countries have different interests. Sometimes these interests compete, sometimes they push in the same direction, and sometimes they are irrelevant to each other. Liberals may not concur about the frequency of interest conflicts or how intense they may become, but we do not believe that they do not exist at all. And who is the last scholar quoted and displayed? Yes, that would be Dan Drezner of "Theory of International Politics and Zombies." I am humbled by his excellent media-whoredom. I am just hoping that the Canadian version of History Channel broadcasts this show. Good times to be a Zombie scholar. I just wish I had caught the wave. Oh well, perhaps NATO will remain relevant and that ethnic conflict will stick around for a while longer. I was listening to a Bill Simmons podcast today where he was talking with Nathan Hubbard of Ticketmaster. A major focus of their discussion was how event entertainment was changing since people can get great experiences while watching from home on their huge HD televisions/sound systems. They both seemed to like not just using phones as tickets (making it pretty impossible for scalping without monitoring) but also using the smartphones during games and concerts to access additional stuff, like player stats. And I have just one question: do these smartphones have infinite batteries? I get nervous having my phone serve as airplane ticket (tried it once thus far), as the phone can start losing power pretty quickly. I guess the new stadia might have power-jacks everywhere. Otherwise, we are going to start carrying spare batteries around, just like the average soldier of the US, Canada and other advanced militaries. I see their point, but unless smartphone batteries get much better fairly quickly, I am not sure we can turn every event into a smartphone-compatible experience. Otherwise, an interesting podcast about what technology is doing to the event business. There has been an emerging discussion on twitter about whether Qaddafi's death and the overthrow of his government counts as a NATO success. Academics then have to ponder what success looks like--output, effects or outcomes (thanks, Stephanie C.). Output would be things like air strikes. Effects would be things broken. Outcomes is where the game is at--and are related to the goals of the effort. To cut to the chase, let's focus solely on immediate outcomes, with the long term up for grabs. That is, we cannot say whether Libya will be a happy and stable place in one, five or ten years. Besides, we need to be fair to the goals of the operation: protect civilians/regime change. NATO bombing (not UN) and IFOR/SFOR ended the Bosnian wars and kept the peace until NATO left (well, the US and Canada left), letting the EU take over. NATO bombing (not UN blessed) and KFOR stopped the massacres of Kosovar Albanians and kept the peace since, with a few bumps along the way. Now, we can ponder whether this was a good or bad thing, as the KLA and its successors did not have clean hands. But the goal was to impose an agreement on Serbia. Three months later: voila. NATO intercedes quickly in a brewing conflict in Macedonia between Albanians and Macedonians, providing the military cover for a EU monitoring mission and some incentives for respecting the Ohrid accords. NATO bombs Libyan targets in support of rebels, leading to regime change. Two other NATO ops are not yet code-able: Afghanistan and piracy. NATO may or may not fail in Afghanistan, depending on whether Afghanistan is at all ready in 2014 (not betting on it). Of course, the four successes can be outweighed by a big failure in Afghanistan, but comparisons might suggest that NATO, although dysfunctional in a variety of ways, can still function enough to make a difference. Indeed, NATO did make a big difference where other multilateral organizations have failed (UN, EC to be quite specific). Piracy is going to be on of those "war on drugs" kind of things--hard to be successful at eliminating a form of behavior. So, we can think about the similarities and differences among these apples and oranges. Two were preventative--Macedonia and Libya. In four of the five, NATO pretty clearly took sides--just not in Macedonia so much. One involved serious counter-insurgency (Afghanistan), two involved supporting an insurgency (Kosovo, Libya), and two involved enforcing a peace agreement (Bosnia, Macedonia). The one with the most significant commitment in terms of $$, casualties and general willingness to engage in a ground campaign--Afghanistan--is, counter to our notions about resolve and commitment, least successful thus far. Anyhow, NATO is 4 and 0 in its post-cold war missions with two missions yet to be decided, but even a 4-2 record will still be better than my media record of this week where both interviews paid little attention to the NATO-related script and asked questions about Libyan politics, of which I know bumpkus. Qaddafi has lost his contest with Hussein and Bin Laden for hiding the longest from US/Allied/Local searches. Lots of folks will make much of this event, as they should. I have already seen a great tweet/blogpost by Spencer Ackerman predicting everyone's responses. What would my readers predict of me? Woohoo? Well, sure. That NATO made a difference despite being hamstrung by the dynamics of coalitional bargaining within and between countries? Indeed. That much of the effort and all of the sacrifices (except for tax $$) were paid by Libyans? Yes. What does Libya teach us about NATO that we didn't know before? Given that I have spent a few years on NATO at war in Afghanistan, the Libyan experience more confirms my beliefs (confirmation bias alert!) than teaches me anything new. And experts on Kosovo might say that Afghanistan just made things clearer. We did see how xenophobia can cause even a fragile coalition government to become more enthusiastic about a military mission--Italy's increased assertiveness as 2011 went on. We also saw that an absence of government (Belgium on day 4xx of caretaker government) means that no veto points means assertive efforts, at least here. Once again, the fear that NATO might fail re-energized efforts and commitment so that NATO would not fail (with lots of help from the Libyan rebels). I ended up making a claim yesterday in class that none of the places NATO has spent heaps of dollars, lives and time really matter that much intrinsically. Bosnia became a NATO mission not because the US cared about Bosnia but that it cared about NATO. Folks kept on the Kosovo mission for fear of NATO failure. Every NATO member showed up to some degree in Afghanistan not because they cared about Afghanistan but because they cared about NATO. Libya shows that NATO matters in that countries needed NATO legitimacy to participate. And the US wavering efforts from beginning to end really hinged on how much the US cared about the alliance more so than the lives of folks in Libya. Which does distinguish Libya, where NATO became relevant, from Syria and Yemen. Once NATO countries got involved in Libya, the stakes for the US and lots of other countries changed. France and the UK forced others to get involved via NATO. And, yes, NATO also matters because the doing of seven or eight months of patrols and strikes and refueling and intel sharing and all the rest requires heaps of military interoperability. Political interoperability may vary across the alliance, but the practice of coalition warfare requires, well, heaps of practice. NATO for sixty years has meant that the militaries are more or less in tune with each other. As we have seen yet again with no stories of mid-air refueling mishaps, for example. Qaddafi is gone, raising questions about Libya's future. I am actually pretty confident that NATO's future will be ... more of the same. I am teaching Civil-Military Relations this spring after not teaching it for a couple of years. So, I am looking for anyone who has suggestions for readings or syllabi that might inspire me. Fun post here that insists it was a draw despite popular mythology of a Canadian victory. The events of this war get short shrift in the US, so I had not realized that the US actually won some battles before the peace treaty (always enjoyed the fact that the Battle of New Orleans occurred after the treaty). "Canada is a nation not forged by war, not hardened through revolution, not fortified by loud exultations of our patriotic spirit .."
Does this mean that Canada was not forged, hardened or fortified? That Canadian nationalism is actually kind of weak due to the lack of formative experiences? Hmmm. I probably would not go that far, although reliance on smug attitudes about American health care is perhaps a weak reed on which to build a national identity. "The struggle that has formed our national character has not been a contest against other people but against the elements, against the cold and the wind and the stubborn rock." Oops, my bad. Nasty winters build character. Got it. The American believe they did, and will launch into Johnny Horton's rendition of "The Battle of New Orleans" at the first twangy chord of a country music banjo. Canadians believe we won, rightly thinking that by repelling the invaders - the American troops - we came together as a country. Has this writer ever been to the US? Meet any Americans? I am pretty sure that not only is the average American unable to sing this song, but they cannot even identify the players in the War of 1812. Oh, and to be clear, to Americans, Canada was not a player. The war in American eyes is strictly US vs UK. The reason why Americans view the war at all as a US victory is that the US could hold off the British empire a second time, even if the US initiated a war that provided no gains. I await the influx of American tourists in the summer of 2012 who will be surprised to learn they are the bad guys in Canada's so-called "most important war." "Canadian decision makers should think long and hard before entering into any coalition to which national caveats have been attached." * Deep in the report, the authors acknowledge this reality, but then do not let this inconvenience them when making recommendations. And, guess what? Canada has them again. The training mission in Afghanistan is quite constrained "behind the wire." So, insisting that others have caveats that pose problems for the Canadians (which happened to be the case for a while) ignores the reality that Canada too has controlled its agents in the field pretty directly via blunt instruments like caveats. Second, if Canada refrains from participating on coalitions where caveats are in play, then when will Canada deploy abroad? Um, never. Really, never. Coalitions of the willing (such as Iraq) had countries that were restricted by caveats. Even working with the US bilaterally is problematic if we follow this logic, since the US has a big caveat on nearly all of its deployments--that Americans must command. NATO will always, always, always have countries imposing caveats on their missions since a consensus-based organization cannot insist on complete compliance, nor can any international organization composed of sovereign states. So, Canada will only be able to act unilaterally under these rules. But Canada lacks the capacity to operate by itself except perhaps for relief missions to Haiti. So, is this really a call for Canadian isolationism? I don't think so, but the implications of a caveat restricting Canadians from working with countries with caveats are pretty clear. I have been engaged in a twitter conversation with Phil Lagassé (No surprise) and folks at the Canadian International Council (first time) about the role Canada played in Afghanistan. The question, of course, was "it" worth "it"? And the focus was on why Kandahar. I have talked about this before and will again, but I want to focus on the last tweet I got yesterday about Canada having more casualties per # of soldiers in Afghanistan than the US or UK. * I created this table a year ago. Some numbers have changed--particularly size of contingent (US pre-surge, CA/Netherlands not yet out) but also the US taking some significant hits over the past year, Canada's number of KIA increased by five before it left and so on. First, Canada barely led in that particular metric just ahead of Denmark. If one uses casualties per home population, then Canada is actually third behind Denmark and the UK and just ahead of the US. Second, this is an indicator that has some intuitive value, but has some flaws as well. 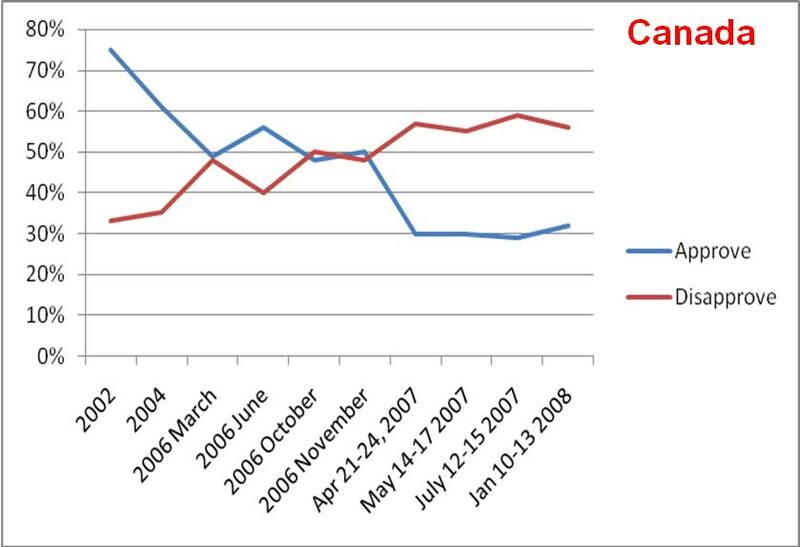 There are more differences between the US and UK on one side and Canada on the other than just per capita KIA. Because the other two deployments are much larger than the Canadian one, the lower per contingent (but much higher aggregate) numbers might be because the UK and the US have a smaller percentage of their contingent engaged in infantry and convoy operations--where Canada has paid a high price. The US and UK have had more folks in helos, in planes, and in supporting such assets, so the relatively small differences might be because these countries had a smaller percentage of troops in harm's way, especially before the Canadians deployed additional non-infantry assets after the Manley report and mandate extension of 2008. Third, what this table does demonstrate is that the big four (UK, US, Denmark, Canada) have been paying a higher price. That comes with the combination of difficult territory (Helmand and Kandahar (and Eastern Afghanistan for the US) and a willingness to take more risks rather than restrict the troops behind caveats and other limitations imposed on commanders on the ground. * I still think the Canadians of the Hillier era and beyond would have been largely incompatible with the highly restricted Italians as their bosses. I have not been told this was a conscious part of the decision-making process, but I cannot help but think that working under the Italians would have been damn near unthinkable for Hillier and the rest of the current crop of Canadian commanders. Canadian leaders, civilian and military, were looking to change how Canada operated in the world. Rather than 40 little missions with 40 little maple leaf flags on UN maps, there was a conscious choice to have Canada focus its efforts to make a difference and to have more influence over what it was doing and perhaps beyond. Going to Chaghcharan where a small Lithuanian unit has filled the gap the Canadians refused to fill would have fit the old strategy of just being present but not much more than that. But doing more than that involved risks--of casualties, of $$ being expended, of bad things possibly happening (detainee scandals, collateral damage, friendly fire, working with the brother of Karzai, whatever), and of mission failure. Just showing up is not a responsible policy. How can one espouse a policy called responsibility to protect (whether that applies to Afghanistan or not, although I lean to the idea that it does) if one just is showing up? Willing to do enough so that one's marked down for "attending" but not really participating is a C or C+ effort that does not get one noticed one way or another. But yet would still cost millions of dollars despite not providing a valued alliance with much added value. Making a difference requires doing something is hard, not easy. Kandahar was hard. Harder than Canadian leaders might have expected (I am beginning to think this was less about intel failure and more about wishful thinking). Focusing on casualties is understandable as they are a simple comparative measure of commitment, but the numbers can be deceptive. At the end of the day, measuring lives is incredibly hard. Was 157 Canadian lives worth it? 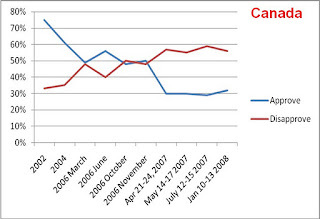 Depends on what "it" is, but if you want to measure the "it" in terms of the lives not lost in Afghanistan during 2006-2011 due to the provision of security (even shaky or limited) by the Canadians and the health care (deaths during childbirth, for example) facilitated by the Canadian presence, as long as Afghan lives are not discounted too much, the balance sheet is quite positive. Canada did make a big difference in terms of lives alone. In terms of influence gained due to the sacrifice of 157 Canadian lives, well, that is an argument that Phil Lagassé and I will be having for quite some time to come.